The Bellrays probably get sick of hearing, "Your albums don?t contain as much energy as your live shows do!" And, though I think their records are pretty damn solid, I will agree with that assertion. The reason is that their live shows are so powerful, so moving, so inspirational ? just flat out in-your-face ? that one can?t help but be amazed at watching the Riverside, California quartet sweat and belt it out at top volumes with a beer in their hands. Their CDs just can?t hold a candle to that experience. With that in mind, it is quite befitting that Music Video Distributors have decided to release a live Bellrays DVD. This is long overdue. 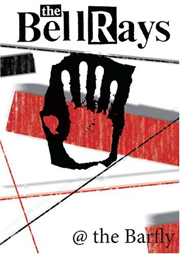 Recorded April 29, 2005 in London at a club called Barfly, The Bellrays rip through sixty minutes (18 songs) of pure soul-infused, hard-rock lovin?, punk-vibe music that their self-proclaimed "punk ?n? soul" title is quite fitting. Hear as front woman Lisa Kekaula transforms Aretha Franklin?s voice into one of the loudest, should-be-most prominent voices in all of rock. If rock is dead, The Bellrays haven?t been notified. Now, Music Video Distributors DVDs are never anything really fancy. You do get an extra on this disc, an interview with the band, but the meat and potatoes of the DVD, as it should be, is just the band, live, unabated, wowing a London crown with music that is straight from the heart. Winding through favorites like "Revolution Get Down" (as heard on that car commercial), "Fire on the Moon", Making Up for Lost Time", and "Sister Disaster", The Bellrays sound like a band straight out of the peak of CBGB?s ? with less pretense and twice the charisma. As The Bellrays say on their albums "Support live music!" And, this DVD is as close to supporting live music as it can be from your living room. I?ll give it an A.